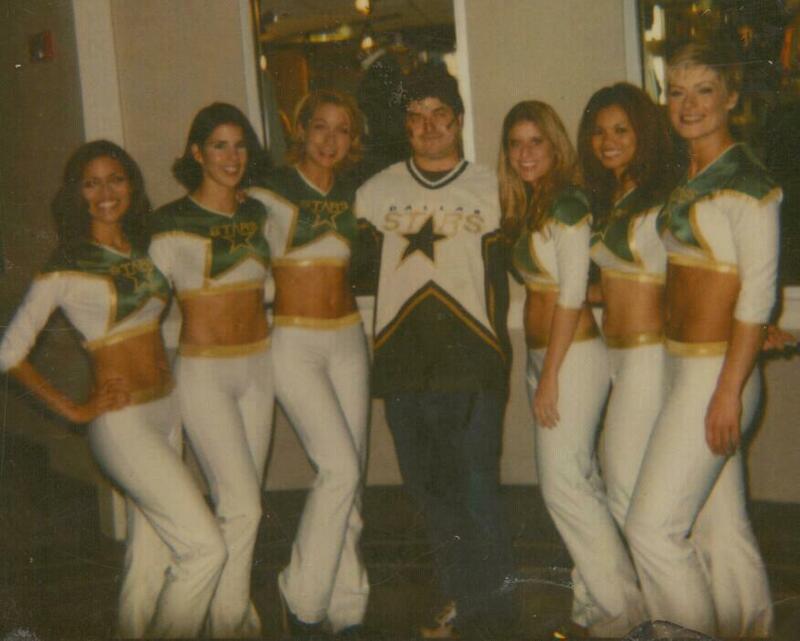 April 1, 2002 the Dallas Stars Ice Girls make their debut as a group of men in drag. The Stars had spent the previous few games setting up this unfortunate April Fools joke. Moments later the real girls skated out and the era of the ice-girls in Dallas had begun. I had seen the Islanders ice-girls and remember thinking it was a great marketing concept. I thought of it as a novelty and not much more. The Stars were only a couple of years past being in the Stanley Cup Finals, that’s where my focus was and I had no time for sideshows. In an effort to walk off our pregame jitters my cousin Bryan and I began the tradition of making several laps around the arena. It carried on to the regular season and if you know me well enough you know I still do it to this day. One day we noticed the ice-girls setting up a table for a meet and greet with the fans. After about our third lap around we noticed there still wasn’t anyone taking notice of the girls. I told Bryan that I bet all they needed was someone to break the ice so let’s help them out. I was right soon after a line formed to get pictures with the girls. I struck up a conversation with one of the girls and we discussed the game. I was surprised to find she was more than I just a pretty face. I was impressed with her knowledge of the game and in the fact that we both played hockey at the same rink. To try to make a long story shorter we became friends and that friendship eventually spread to the rest of the squad. After the 2004-05 lost season due to labor disputes I had lost most of my connection with the squad. That was until I was asked to join the Stars Fanatics. As a member of the Fanatics we were able to work with the ice-girls doing many promotional and charity events. During these I found a new love for promoting the game of hockey. Dressed up in my wig and war paint I would walk with the girls, meeting fans and taking pictures. I had learned that if a person remembers their first game as a pleasant experience then win or lose they will want to return. That is what the ice-girls do. They are ambassadors of the game. Years down the road when someone recalls their first game they may not remember all the details of the game itself, but they will remember the greatness of the sport, they will remember meeting the ice-girls, and perhaps if I’m lucky they will remember that crazy guy in face paint that gave them a monkey and a smile when they were younger. The girls have helped me turn my pregame ritual into an opportunity to meet new Stars fans, to mingle with them and help make it a pleasant experience for them regardless of how well the team is doing. When you see me make my rounds don’t hesitate to stop me and say hi. I am happy to meet new friends every game. When you go to the games with me for the first time and it seems like I know everyone at the arena that is why. I am only following the lead of my ice-girls sisters.